I have been using this washing machine for the past 2years.Before this i was using a national brand washing machine bought 6 years back.I was looking a similar type without a steel body.Steel body of that washing machine(national)was the only negative point in that,otherwise it worked perfectly. I have used fully automatic washing machines with IFB,but will recommend only semi automatic.With my past experience i feel semi automatic washing machines are easy to maintain and nearly zero repair charges. 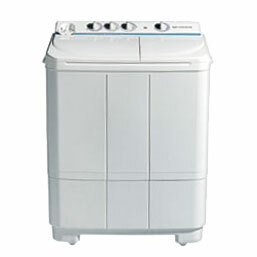 This Videocon multie 6800 has a capacity of 6.8kg.It offered value for money as i compared with whirlpool,LG and samsung at the time of purchase in the showroom at chennai.With this brand i was able to get a rust free body and additional capacity when compared to my previous national brand washing machine. Another useful tip while using a semi automatic washing machine is that we can save water since we can take out the cloth and reuse it for another washing.The next is we can save time as we can simultaneously wash with the machine and rinse even manually when we are to wash more clothes. There is a usual problem says to by many while washing with the semi automatic washing machine.When we wash without ample water ratio to clothes,during washing the clothes get tied to each other.With my experience i was able to undo this problem by the selection of garments while washing.I will not use full sleeves with pants and so on. Another drawbacks with washing machine is the stain not being removed from the collars.For this we need to apply extra detergent at the particular place before starting to wash.We will be using a minimum of four scoops of detergents for washing ten clothes.It is better to wash light color clothes first.This will avoid these clothes being stained if any other dark colored clothe which has poor fastness problem. The semi automatic has a longer life than fully automatic due to a separate drum for spinning.In a country like India we can use spinning if needed due to the climate. With this Videocon multie 6800 i am able to wash continuously for two hours.This i have been doing for the past two years with no problem at all.I am a fully satisfied customer of this brand. This machine is very help full for people. we get it as online very easy for buying this.Like many online service for writing also essay writing service.